The current Vegas and Winnipeg franchises recorded the same feat Wednesday, in their first and 18th years of existence respectively. That puts Vegas in rare company amongst expansion teams across sports. While some have won titles after a few seasons (and the Chicago Fire even won a MLS title in their first season), most haven’t even passed .500 in their first season, so what the Golden Knights have accomplished here stands out. 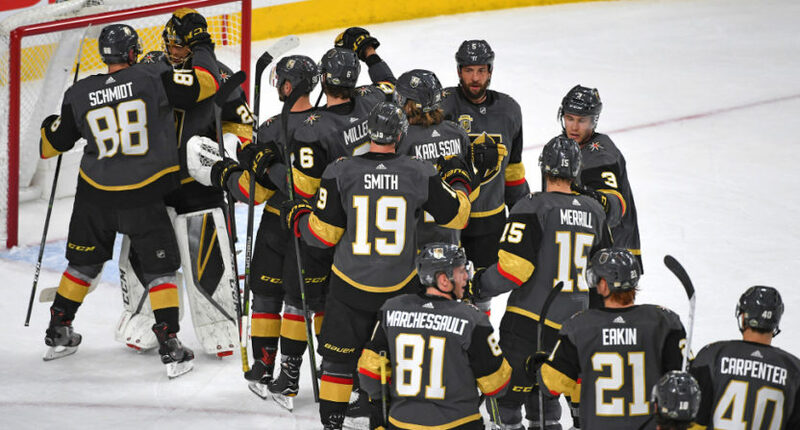 In fact, FiveThirtyEight’s Neil Paine wrote in January “Vegas Has The Best Expansion Team In The History Of Pro Sports, And It’s Not Close.” And that’s particularly true when you consider how the Golden Knights sustained that momentum and parlayed it into a good playoff seed, and how they then followed up by picking up a postseason win in their very first opportunity. Winning a NHL playoff game is far from easy, and a case in point there comes from another franchise that accomplished the same feat Wednesday night, but in its 18th season. That would be the Winnipeg Jets, who put up a 3-2 win over the Minnesota Wild. Teams named the Winnipeg Jets had previously won playoff games. The original Jets franchise was established in Winnipeg in 1971 (beginning play in the 1972 season) as a World Hockey Association team, and regularly made the playoffs in those years, winning three league titles (the Avco Cup) by 1979. They became one of four WHA franchises to cross over to the NHL in 1979-80, along with the Edmonton Oilers, Quebec Nordiques and Hartford Whalers. Yet while that team never lifted the Stanley Cup, they made the playoffs in 11 of their 17 seasons, including their final one in Winnipeg (1995-96). But those Jets moved south before the 1996-97 season and became the Phoenix (now Arizona) Coyotes, so while their past accomplishments are notable for the city, they’re not really applicable to the current franchise. That franchise started its life as the expansion Atlanta Thrashers in 1999, and its history shows a much more typical route for an expansion team. Yes, there were mistakes made along the way (like drafting Patrick Stefan first overall in 1999 ahead of, say, Daniel and Henrik Sedin), but the Thrashers’ initial 14-, 23- and 19-win seasons are much more standard for an expansion team. And they continued to struggle even after those first seasons, only making one postseason appearance while in Atlanta (in their seventh season, 2006-07, where they were swept in the first round by the New York Rangers). Things got a little better after the move to Winnipeg ahead of the 2012-13 season, but the new Jets still only managed one postseason appearance before this year, which saw them swept by the Anaheim Ducks in 2014-15. So their history is certainly evidence that a playoff win is nothing to be taken for granted. Of course, the Jets are perhaps an extreme there. Other NHL expansion teams have done better, with the Florida Panthers making the Stanley Cup Final in their third season (1995-96), the Wild making it to the conference finals in their third season (2002-03), the San Jose Sharks making the playoffs and winning a first-round series in their third season (1993-94), the Anaheim (then Mighty) Ducks making the playoffs and winning a first-round series in their fourth season (1996-97), the Tampa Bay Lightning making the postseason and winning two games in their fourth year (1995-96), the Ottawa Senators making the playoffs and winning three games in their fifth season (1996-97), the Nashville Predators making it and winning two games in their sixth season (2003-04). The Columbus Blue Jackets are the most recent expansion team to experience similar struggles to the Thrashers/Jets, only making the playoffs in their eighth season (but getting swept then) and only recording their first playoff win in their 13th season (but losing that first-round series 4-2), but they’re still a little bit ahead. However, at least some early struggles are typical of expansion teams in all sports, and that’s also true in the NHL. And while some NHL expansion teams have managed to be at least somewhat contenders within a few years, that’s far from a universal case, and there are plenty like the Thrashers/Jets, Blue Jackets and Predators who took longer to develop. So that says something pretty remarkable about what these Golden Knights have done. We’ll see how they build on this, but making the playoffs and winning a game in their first year is pretty astounding in its own right.